How are neighborhood revitalization efforts like these financed? How are Community Development Financial Institutions and impact investors working across-sectors to improve neighborhood health and well-being? Four community investment experts shared their insights and practical tips during our February 25 Network Commons event. 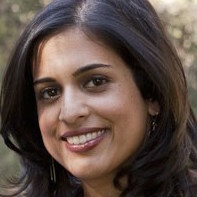 Norah McVeigh, Managing Director of Financial Services, Nonprofit Finance Fund (NFF). Check out the highlights. Missed the event or need a refresher on our speakers’ practical tips? 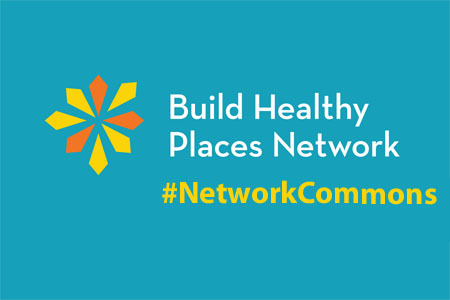 Check out this video recording of the February 25 event on the Build Healthy Places Network’s YouTube channel. Learn more. 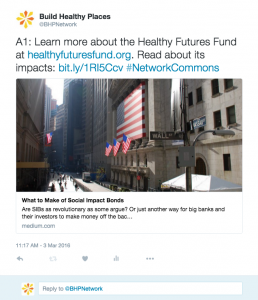 Check out our recent long-form Medium pieces, “What to Make of Social Impact Bonds” and “Investing With Health in Mind” (featuring the Healthy Futures Fund and the Healthy Neighborhoods Equity Fund). Continue the conversation. Still pondering how to measure the impacts of health investments and how CDFIs are working with hospitals? 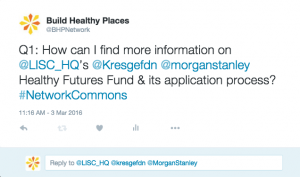 We’re continuing to answer these and other audience questions via Twitter @BHPNetwork #NetworkCommons. Join the conversation and tell us what you think! Senior Research Associate, Jeni Miller was joined by: Romi Hall, Healthy Neighborhoods Manager at East Bay Asian Local Development Corporation; JT Hannan, Director of Public and Governmental Affairs at Bayou District Foundation; Maureen Hansberry, Real Estate Portfolio Manager at the Children’s Hospital of Philadelphia; and Mary Wheeler, Program Officer of Health and Wellness at Twin Cities Local Initiatives Support Corporation. Executive Director, Doug Jutte was joined by: Lisa Chamberlain, MD, MPH (Stanford University School of Medicine); LaMar Hasbrouck, MD, MPH (National Association of County and City Health Officials); Pamela Riley, MD, MPH. (The Commonwealth Fund); and Donald F. Schwarz, MD, MPH, MBA (Robert Wood Johnson Foundation). Executive Director, Doug Jutte was joined by: Anneta Arno, PhD, MPH (Health Department of Kansas City), David Fleming, MD (PATH, formerly Seattle and King County Public Health), and Reginauld Jackson, DrPH (Public Health Institute). Executive Director, Doug Jutte was joined by: Amy Gillman from the Local Initiatives Support Corporation (LISC), Carol Naughton from Purpose Built Communities, and Joselyn Cousins of the Federal Reserve Bank of San Francisco.